Polarizing or non-polarizing beam-splitter cubes and prisms are used to transmit one wavelength band (either polarized or non-polarized) in one direction and reflect another wavelength band (with a different polarization or non-polarized). Polarizing beam-splitters usually reflect a wavelength band with one orthogonal polarization (s or p) and transmit the same wavelength band with the opposite polarization (p or s). Non-polarizing beam-splitters keep the same polarization in both beams. 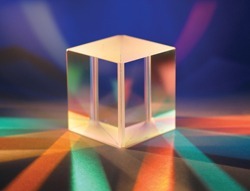 Iridian has supplied numerous beam-splitter cubes for applications such as projection displays.